Ask RP Photonics for advice on how to measure, remove and model chirps in ultrashort pulses. The chirp of an optical pulse is usually understood as the time dependence of its instantaneous frequency. Specifically, an up-chirp (down-chirp) means that the instantaneous frequency rises (decreases) with time. 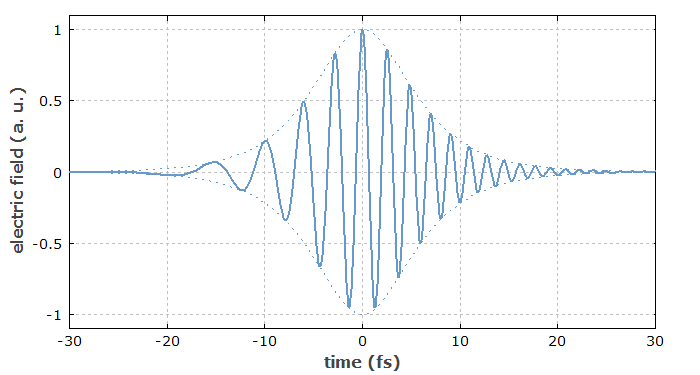 Figure 1: Electric field of a strongly up-chirped pulse, where the instantaneous frequency grows with time. A pulse can acquire a chirp e.g. 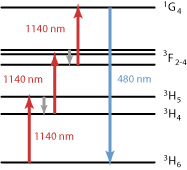 during propagation in a transparent medium due to the effects of chromatic dispersion and nonlinearities (e.g. self-phase modulation arising from the Kerr effect). In semiconductor lasers or amplifiers, chirps can also result from refractive index changes associated with changes in the carrier density. The chirp of a pulse can be removed or reversed by propagating it through optical components with suitable chromatic dispersion. For a given pulse spectrum, the minimum pulse duration is obtained when there is no chirp (“unchirped pulses”). This condition is equivalent to a constant instantaneous frequency, and (nearly) equivalent to a constant spectral phase. The magnitude of a chirp can be considered to be the rate of change in the instantaneous frequency, e.g. in units of hertz per second. In the case of nonlinear chirps, this quantity is time-dependent, i.e., not a constant number for one pulse. It is also possible to specify the amount of group delay dispersion (in units of seconds squared) required to compress a pulse dispersively. More precisely, this may be the second-order dispersion which leads to the smallest pulse duration, or to the highest peak power. Such definitions are not related to each other in a simple way. For example, an increasing amount of normal chromatic dispersion applied to an initially unchirped (transform-limited) pulse will obviously increase the amount of dispersion required for compression. On the other hand, the chirp in terms of the rate of change of the instantaneous frequency will initially increase, but later decrease. The latter results from the fact that the same change in instantaneous frequency will occur within a larger and larger time interval, as the pulse duration increases. 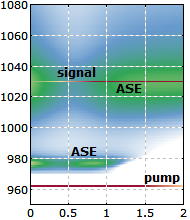 As a second example, an initially unchirped pulse subject to self-phase modulation via a Kerr nonlinearity will exhibit an increasing optical bandwidth. For increasingly strong spectral broadening, the rate of change of the instantaneous frequency increases, whereas the amount of dispersion as required for maximum compression can decrease. In systems for fiber-optic communications, one often uses directly modulated laser diodes in the data transmitters. A side effect of the power modulation is that the carrier density in the active region of a laser diode changes, and this leads to temporally varying phase changes, i.e., to a chirp in the laser output. Whereas this is not seen when analyzing the optical power vs. time at the laser output, that chirp can have substantial effects when the data signal is transmitted through a long optical fiber. Essentially, this is because the chromatic dispersion of the fiber means a frequency-dependent time delay, and this in conjunction with the chirp leads to signal degradation. Therefore, larger transmission distances require a low chirp, as can be achieved by using transmitters with continuously operating laser diodes and separate optical intensity modulators. The term “chirp” is sometimes also used in another context, when the instantaneous temporal or spatial frequency of some quantities other than the electric field varies. This can occur, e.g., in fiber Bragg gratings with aperiodic gratings, where there is a chirp of the grating period. The same applies for other kinds of chirped mirrors. There is also the concept of spatial chirp, essentially meaning a spatial variation of peak wavelength within the beam cross-section. This, however, is not a precisely defined quantity, but rather a name for a phenomenon.